When you're trapped in a cycle of financial frustration, and you feel like you've tried everything only to end up with more month than money yet again, More Than Just Making It is your promise and pathway to thriving again. Take it from someone who's been there. Erin Odom grew up in the private schools and neatly manicured lawns of Upper Middle Class America, but was thrown into low-income living during the economic crash. She was a stay-at-home-mom, her husband was supporting the family on a teacher's salary, and despite the fact that they had no debt to their name, they were scrambling to make ends meet. Suddenly Erin found herself standing in line for food stamps, turning down play dates because she couldn't afford the gas, and ultimately walking into bankruptcy court in the eighth month of her third pregnancy. More Than Just Making It tells the story of their breaking point, as well as the triumph of their comeback. It took hard work, creativity, and faith in God's provision to reset their bank account as well as their hearts, but ultimately they found a new way to thrive and freedom from financial anxiety. You can do the same. Learn how Erin and her family saved enough money to put $30,000 down on a home, buy a minivan in cash, and begin sending their daughter to private Christian school. More Than Just Making It will encourage readers to rise above their circumstances, empower them with money-saving tips, and reimagine the good life as God designed it outside the myth of the American Dream. 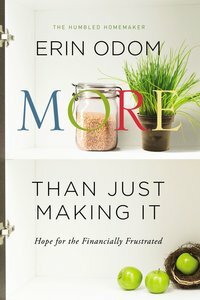 About "More Than Just Making It: Hope For the Financially Frustrated"